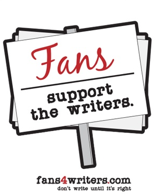 Hey writers! Will Ferrell is hip to owning and distributing his own content. So can you! Within six days of launching Funny or Die, Ferrell's first video offering "The Landlord" garnered 24 million hits. And he didn't need the networks to do it. He used the Internet. In this article "Funny or Die — and the challenge to the Long Tail" tech analyst Bernard Moons discusses Will Ferrell's creating, owning and distributing his own content. With distribution channels disrupted by new technologies, user-generated content is on the rise and the AMPTP are looking over their shoulders to stay on top of it. One way to do this is to make you guys think you need them. As for the video below, the one scene that I feel could have made this piece better is a shot from the picket lines with writers putting down their signs to "high-five". The Internet is all about D.I.Y. Man your laptops, WGA! Rally to the call "D.I.Y. or die!"